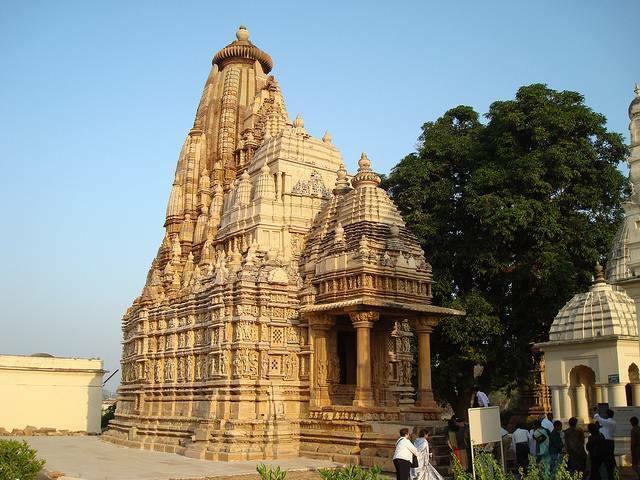 Though not as easily accessible as the Western group this collection of isolated temples that are strewn upon the area, is no less than any of the other temples of Khajuraho in its beauty and grandeur. Along with the Hindu temples for Brahma, Vamana and Javari, three Jain temples - Parsvanath, Ghantai and Adinath temple, also come under this group. Parsvanath Temple is the largest of the group and has the most exquisite carvings crowding the walls. The style and architecture of the three tire roof is an amalgamation of Hindu, Jainism and Muslim influences. Located in a secluded place, Vamana temple is a simple yet elegantly designed temple dedicated for Lord Vishnu who is idolized here in his dwarf form. Ghantai Temple in this group is a Jain temple, a structure that is simple yet pleasing for the visitors. A frieze illustrating the 16 dreams of Mahavir’s mother is one of the popular carvings found here. Adinath temple is a Jain temple, the walls of which are an embellishment of heaven, with numerous beautiful sculptures of yakshis depicted in various forms and actions. Their youthful forms are a rare combination of ravishing beauty and soothing divinity.